Plants minute, partly creeping, with erect parts to a few mm tall, the creeping part longer. Thallus branched alternately every 5-10 segments. Apices little incurved. Segments with four pericentral cells, each producing two upward-corticating initials, one basipetal initial. Cortication remaining very limited, with usually two acropetal layers and two basipetal layers, with a clear separation. The central cells stretching to several times their diameter. Axis to about 50 µm thick, segments at first a little shorter than broad, later to 500 µm long or 10 times as long as broad. Rhizoids one or two per segment, unicellular, arising directly from the periaxial cells. 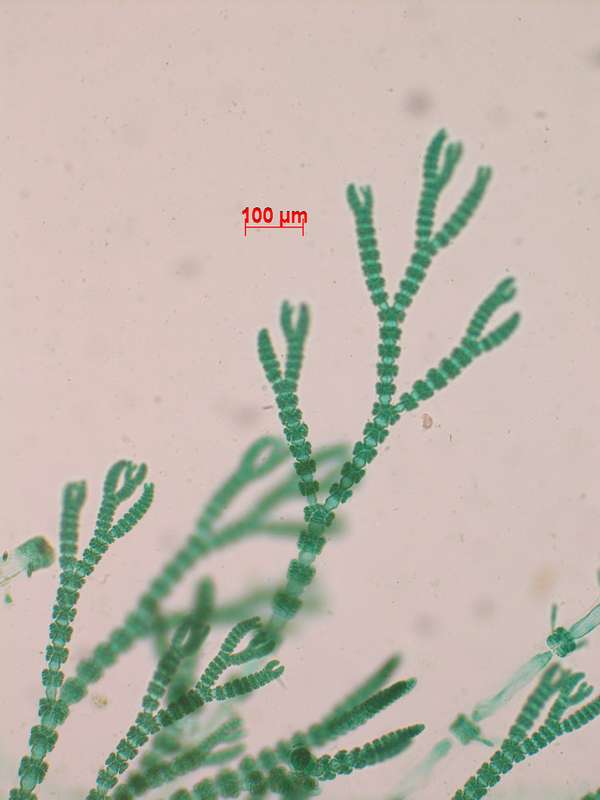 Tetrasporangia up to two (to three) per segment, largely covered by corticating filaments, roundish, measuring ca. 40 µm. Other reproductive material not seen. On the south coast found only in eastern Transkei (47), epiphytic on Amphiroa ephedraea; other species of the genus Gayliella have a more western distribution. World distribution: scattered records from warm temperate and tropical locations. Type locality: Spanish Rock, Bermuda (Silva et al. 1996). Material (HS): Mkambati, 7-10-2002: EC1712 (on Amphiroa ephedraea). Note: . Formerly known as Ceramium byssoideum, a name no longer available for this entity (Silva et al. 1996). Gayliella transversalis, Mkambathi. Stained slide material. Gayliella transversalis, cell detail, Mkambathi. Stained slide material. 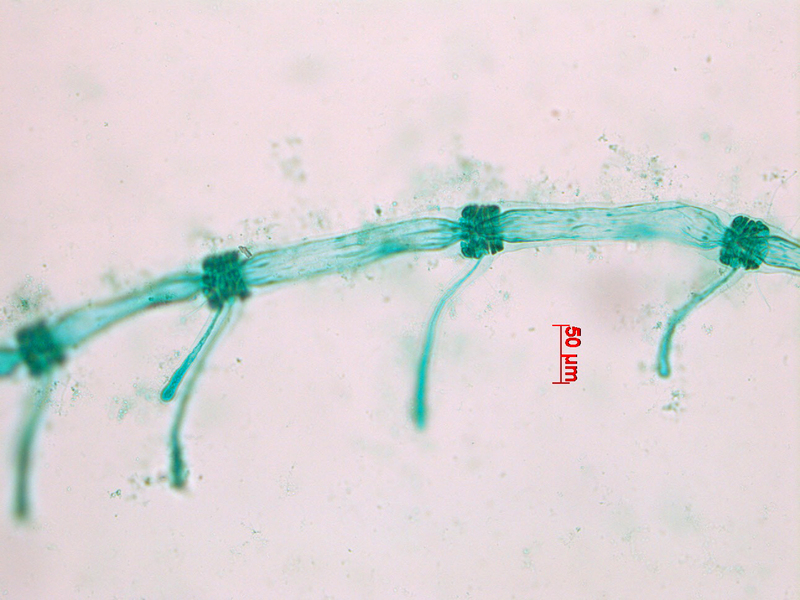 Gayliella transversalis, Mkambathi, creeping filament with attachment rhizoids. Stained slide material. Cho, T.O., Boo, S.M., Hommersand, M.H., Maggs, C.A., McIvor, L.J. & Fredericq, S. 2008. 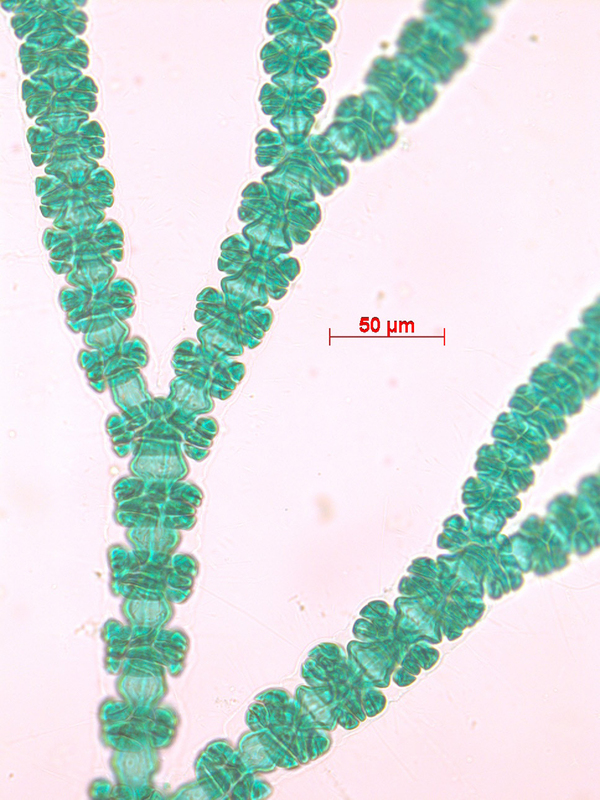 Gayliella gen. nov. in the tribe Ceramieae (Ceramiaceae, Rhodophyta) based on molecular and morphological evidence. Journal of Phycology 44: 721-738, 11 figs.